Dr Doug McGuff performing stoic barbell curls at his facility, Ultimate Exercise. Dr Doug McGuff (@DougMcGuff / Instagram: ultimate_exercise_) is frequently labeled as one of the world’s top experts on exercise and in particular, high intensity strength training. 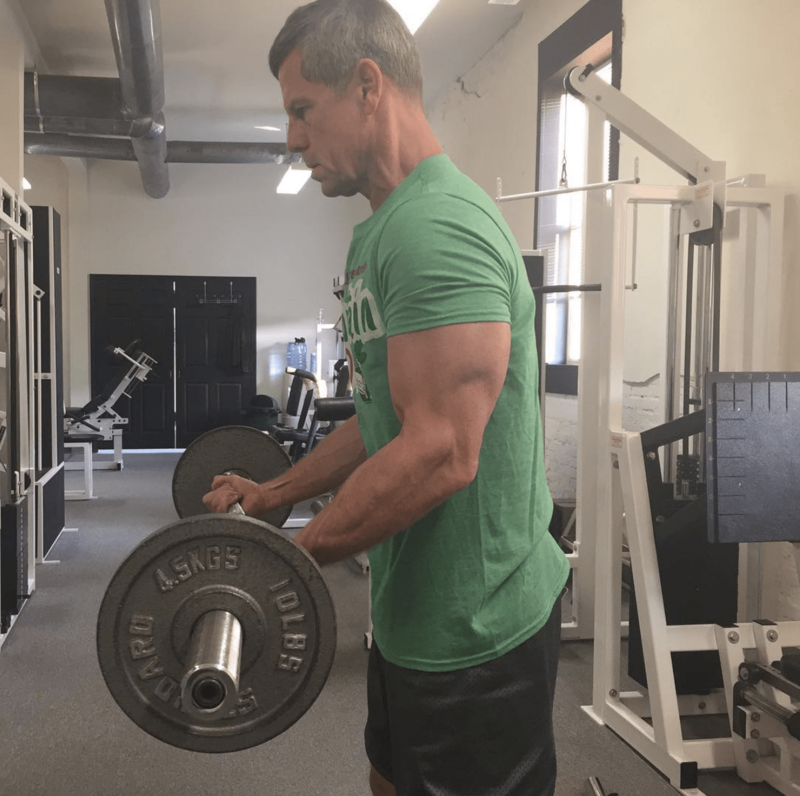 Doug practices full-time emergency medicine with Blue Ridge Emergency Physicians and owns, Ultimate Exercise, where he and his instructors continue to explore the limits of exercise through their personal training of clients. Doug regularly posts his exercise thoughts and findings on his blog and YouTube channel, and provides consultancy and other products and services via DrMcGuff.com. Doug’s popularity exploded with the release of his ground-breaking book, Body By Science, which he published with John Little. Soon after, Dr McGuff and Dr Robert P. Murphy published The Primal Prescription: Surviving The “Sick Care” Sinkhole, an expose on medical care, how to get the best care when you really need it, and a prescription for wellness, longevity and personal accountability. This was an eclectic episode that touched on a number of different areas. As this may be the last interview I do with Doug for a while (he’s incredibly busy), I took this opportunity to go beyond strength training to talk about things like investing, cryptocurrency, success and even relationships. Doug provides a very intelligent and thoughtful perspective on all of these topics and more. I look forward to listening to this interview again and again. I hope you will feel the same. This was one of the most profound conversations I’ve had in my entire life. Dr Doug McGuff using the Nitro Nautilus Overhead Press at The Brickhouse Gym in Columbia, South Carolina. What calorie surplus is required for optimising muscle gain? This episode is brought to you by the Resistance Exercise Conference – The science and application of strength training for health and human performance. You will learn from the top strength training researchers, connect with exercise professionals from all over the world, get a workout from an expert trainer and get inspired, rejuvenated and focused on your strength training business. You will get the chance to chat with guys like Dr James Fisher, Luke Carlson, and Jim Flanagan. I will be attending with many of the Corporate Warrior listeners and I’d love to meet you in person. The resistance exercise conference will be held on the 9th and 10th of March 2018 in Minneapolis, Minnesota at The Graduate Hotel. I’m very excited about this and have wanted to attend for years. Sign up now at ResistanceExerciseConference.com, get 10% off your entry fee and $50 off your stay at the Graduate Hotel (normally $160 per night) with promo code corporatewarrior10 and I look forward to meeting you in person! Thanks Mike. I’m considering reducing to 6 episodes per month to reduce listener “anxiety” lol. Fantastic interview Lawrence, very in depth and interesting. Definitely needs a second time around absorb everything! Dr. Doug is Back! Awesome! Doug’s Shrine at home… haha, that was a cool one Lawrence! Listening to every single one of Doug’s interviews, has always been a real treat for me! 1. With regards to Dr. Ted Naiman’s protocol…Besides, the possible difference in set’s execution/intensity between people (and despite the fact, that sustaining/recovering form workouts, still does not mean progress), does Doug see a problem with one “getting accustomed to same movements done every day”? Call it skill or else, but could it be, that the exercise stimulus effect is compromised beacause of frequent practice? I believe in Body by Science, the Hard Facts about Soft Tissue chapter, contained a statement, that doing the same aerobic activity over end over again, say the treadmill run, will reduce it’s calorie burning effect over time and very fast too. So is the is this situation similar to doing pull ups every day for example? 2. Along the lines of the above, I had read in the past an analysis of Mike Mentzer’s Ideal routine by a russian physical scientist – V. Protasenko, where he comes to the conclusion, that one of the main reasons, Mike’s routine works is not so much because of enchanced recovery (training each bodypart abt. once every 2 weeks), but because training this way, with this super low frequency per muscle group, it actually makes every successive workout being close to like the first workout, because of muscle deconditioning occuring dirung two weeks pause and thus same exercises still are a valid stimulus. What would Doug make out of such a statement? Recovery if dependent on Inroad, Intensity, Volume of effort etc. but everything is relative in life, but still. 3. Regarding exercise equipment, machines, bodyweight…all have some issues of a mechanical nature – sticking points or constant uncertainty of the fatigue-inroad achieved, that a trainee may experience. I know, that Doug has used a new generation machine like ARX. Does Doug believe, that many of the typical issues are really solved with such an equipment – sticking points, making sure and ability to quantify/compare force/fatigue/inroad achieved, ability to contract in a manner that is far more natural to one’s system (where you can push voluntarily as most comfortable, not necessary to “think starting slow” and you move slow as a side effect, as you can not change the speed, but you can try to do it in a manner that suits you)? Thanks Kamen. Doug is a very busy guy, but I’ll ask him. So Lawrence , it seems that I asked either very hard or very dumb questions . I see that Doug took the time to answer to others through you. Well I’ll keep on waiting, because I really would like to here a competent opinion on these topics. Exactly. Thanks for posting this George. Doug’s time is valuable. Hey Lawrence, you are welcome. Nevertheless i hope there will be another Podcast with Doug soon!???????? https://link.springer.com/article/10.1007/s00125-017-4496-8. Granted, this was in healthy individuals, ‘bulking'( although this study is in GOMAD territory) may not be that damaging in short periods in this population. Also funny how Doug is the only one i’ve ever heard talk about male smell/leukocyte androgen receptor and attraction , NO ONE talks about this at all. Need to listen to this one again and dive a bit deeper. Interesting! Thanks for sharing this Julien and kudos for keeping an open mind. Thanks again for your support and kind words. thank you Doug and thank you Lawrence for providing Doug’s anwser. It is profound what 2x fullbody exercise(for me) can do to your energy levels/movement/NEAT. Especially if I compare myself to years ago, when I was not training. I like this biological part of the attraction picture, because it is so relevant in this digital world we live in where meeting people IRL is replaced by apps. Intense exercise can protect against mitochondrial damage via rebalancing energy signaling pathways. Combine sedentary state with overfed state=mitochondrial damage. When checking out Human Leukocyte Antigen (HLA) compatibility also search the term “Histocompatibility”. Interesting stuff. Realize some of that discussion is my own belief on the topic, but the science I believes supports my assumptions on this topic. Put this in the “what I believe but cannot prove” category. While I prefer episodes that focus in on a narrower range of topics, Doug is so listenable that I didn’t mind the breadth covered here. touching on one subject in particular I’d love to hear an episode devoted to study design and the many pitfalls and biases in both the studies themselved and their interpretation. Thanks Andrew. I’ve noted this down, and will look to create a focus episode on this specific topic. I was talking to a listener and friend recently who said he could listen to Doug talk about practically anything haha. Stephen Novella would be absolute gold standard for this subject, not for exercise per say but for bringing you down to reality over this subject there’s no one better. Great interview, and way too much to comment on everything! Major inspiration for me on two projects I’m working on. Hearing Doug talk about working on his book one paragraph at a time, and reaffirming Lawrence’s discussion on choosing a Most Important Task were quire helpful. I’ll tackle little bits at a time and see how much I can get done during 2018! That really rang true for me too, a while back, after messing around with guitar for years I sat down for 15 mins every day of proper practice. After a year I had transformed from long time novice to actually proficient. It’s amazing what you can achieve with so little effort. You shared the blog post with me, but I don’t think the podcast. I’ll have to check that out. I’m about three weeks into consistently choosing an MIT for the day and starting to get focused in the right ways about getting more good clients. I enjoyed the information from Dr. McGuff on timed static contractions whereas he related about Mr. Ken Hutchins incorporating this technique for conditioning of the neck. I have also benefitted from Mr. Hutchins advice while incorporating static contractions on the Nautilus pullover. I tried his advice because I was having severe spasms in the interscapular/nape area every time I used a full range of movement. These types of static contractions have helped, along with resistance bands for neck static contractions. Furthermore, I incorporate Nautilus leverage machine shrugs in a static contraction manner….22 inch neck fitted shirts are all I can wear….especially with a tie….required décor in my profession. As regards extreme fat loss/loose skin, restricting dietary protein to ~ 4 % or less allows the apoptotic process to perhaps use the protein (protein recycling) of the loose skin and collagen therein. Compliance of such would be a concern. Dr. Valter Longo has a new book on human longevity….and he clearly believes to restrict protein…especially animal protein…..in order to decrease IGF-1. Thanks for sharing the info about Dr. Longo’s new book Marc! It seems that the “protein consumption” discussion will be very interesting in the future. Things are far from clarified in this field imo. Yeah, I think that question might have been one of mine, I’ve lost roughly 30KG/70lbs or 6-8 inches on my waist in just under 2 years, so not extreme loss but plenty still. I’m happy to say that as the adipocytes have continued to shrink that the skin is recovering much better than I had feared, without the extra weight pulling it down it’s looking better week on week. As for the protein restriction, I don’t know what to think. Personally I feel like if you’re doing something with it above maintenance levels i.e. resistance training then it’s biologically useful, if you’re sat on the couch shoveling hotdogs down your gullet every day then maybe it’s not doing you any good at all. Dr Longo’s new book is not without some issues. I only brought up protein restriction to give a reasonable solution to extreme fat loss/loose skin on this discussion. Dietary protein is controversial and from my experience such discussions do not change others views at all…only time does. This topic is on Dr. McGuff…..let us give him respect on his topics. Thank you for your contribution Marc, as always. Perhaps this episode should be called “A random walk through Dr. McGuff’s mind?” Definitely an interesting and entertaining conversation. I appreciate the honest introspection shown by some of his comments. hahah yes the topics were random, but I don’t think they are disparate. They all link together in a strange kind of way. Hey Lawrence, always love hearing Dr McGuff talk. A few things i thought i’d make some comments on. Since Ted Naiman and his daily body weight program was mentioned First is how people look at over training. And frequent training Yes i think it’s a real thing, but the reality is the Soviet Union did studies on it, and the amount of volume it involved to have a negative effect is a lot higher than most normal people ever go through. Plus even Drug free people got involved with Daily Squating and Dead lifting programs after the so called Bulgarian and Russian training programs were written, and other such programs. We can look at Gymnastic practitioners who are training daily. We could also look at mostly unmechanized Farmers, and Lumber Jacks, who had no choice of daily carrying and lifting. And yes they’re not going to failure, but still the amount of workload they were performing is incredibly high. And often times some of these people would lift weights too and get involved with other sports too in there spare time. And these are just a few examples. I think it comes back to something people like Mike Mentzer and Arthur Jones mentioned before. ” Why try to find the most amount of exercise to get results? Why not find the least?” Especially if people are going to get involved with other sports etc. Your focus should be more on those any way if you want to get better. But for Ted Naiman, he’s busy with work, this seems to be his only activity, and Steve Maxwell and others have pointed out the importance of daily activity. In fact i recently saw a study mentioned with type two diabetics and having them walk for a hour daily at a brisk pace and the benefits that had. On another note, since you’re looking for ways to make your Body weight training harder you could look into Gymanastics movements. And no i’m not talking about lengthy workouts, i’m just talking about how they change the leverage on the exercise, to increase the difficulty of the exercise. As far as weight loss needing some sort of deficit i totally agree, and in fact all the experts that are proponents of Low Carb diets that came from a background of training people for performance like Rheo Blair, and Vince Gironda back in the day, to Charles Poliquin and Dr Mauro Di Pasquale, and Dave Palumbo also agree that a deficit is important. But they feel that Low Carb diets are superior for health and performance, and i think it just comes down to hormones. I’m sure since you’ve had Shawn Baker on, and eating more of a Carnivorous diet yourself, and seeing some of the comments from the people in those Zero Carb groups where there body composition changed dramatically even though there activity levels and exercising had stayed the same. Plus years ago when i was in the Air Force seeing some of the guys use steroids, which obviously have no calories just put on muscle like that. Definitely left a impression. And in the opposite way, countries like the US and UK with the amount of environmental pollutants which are very estrogenic, i had seen some articles where some fitness professionals were having troubles getting there teen age clients in shape, even though they were following a supervised diet and exercise program, and they had there hormone levels checked finally and they were totally out of whack. Finally i have to comment about the Crypto Currencies comments ha ha ha. I had commented on one of your posts on Facebook about this before. But the reality is there are enormous opportunities with Crypto Currencies right now. And they don’t have to be as risky as what i feel you think it is. It is true though that there is a ton of people that are treating this differently than say they wanted to actually get good at trading Options, or Forex or Stock market. Treating it more like going into a Casino and putting money down on numbers of a Roulette table or buying lottery tickets instead of doing there due diligence, and studying, following the right mentors, and making informed decisions. Actually there’s still plenty of people that have treated Stocks etc the same way too, but maybe not as much since the tech boom. The big things with Crypto Currencies is to not let FUD, Fear, Uncertainty, and Doubt get in the way. For instance there’s dips every year, right now there’s a huge dip, which actually makes a great time to buy. The sad thing is a lot of people instead of just holding what they had freaked out and sold. Another key factor is to Not to let your Emotions, and Personal Likes and Dislikes get in the way. At the beginning of December Ripple, ( which is just another coin) was at 25 cents a coin, there was a lot of buzz and backing from people such as Mcafee, well it went up to 3 dollars and fifty cents a coin by beginning of January. At that point things were looking to turn around some. But there were people wasting there time arguing and discussing the merits of the coin blah blah blah And missed out. While others just got in and got out. Also you’re right there are a lot of coins that aren’t going to go anywhere, same way with some ICO’s but that doesn’t mean that getting involved with the right ones, you can’t leverage a small amount of money into larger amounts. Or if people are conservative and just hold some of the more popular coins etc That they can’t capitalize with minimum risk. The fact is there are a lot of ways that people can capitalize with Crypto that doesn’t involve a ton of risk. And then like any method of investing, put things in play to minimize risk and maximize profits The problem is they don’t have the patience, or want to spend the due diligence to learn more. Or they don’t have the temperament, they just freak out when things change, or get greedy and blow it that way too. Thanks for the comment James. It’s a post in and of itself! I guess I like digging into the frequency/volume argument for maximisation not the least amount necessary. With regard to Cryptocurrency, whilst I have invested a small amount in ETH (€750), it was a punt and I’d much rather invest my time and energy into CW 😉 at least for now. Ha ha ha I get going lol. But know what you mean about maximization. And while i had mentioned in one of the previous podcast comments, i had been exposed to Arthur Jones and his info at 14 which was great, and always seemed to make sense. But like that Bruce Lee quote about adapting what is useful etc. I’ve also always been a observer and open minded, so open to other ideas. And one thing especially at least when it comes to conditioning and work capacity it seems that more volume is really helpful. For instance i have been listening to a interview series of a former special forces operator and Trainer who still trains people to enter various Special Operations fields. He found people doing Crossfit, and other types of bodybuilding etc Just didn’t do well, and His trainees kill it in the selections, but they’re doing more volume of loaded back packing daily, “Rucking” and more volumes of Calisthenics and Manual Labor type of training, building the capacity to go and go, but still be just as strong. Because if you have to carry 80lbs of Body Armor and weapons and pack, and hike 15 miles and then you’re supposed to fight when you get there. Good luck. Also had seen articles on old time strongmen, and current strongmen and women performers from Cirque Du Soleil, they’re doing multiple shows a week, and they’re also training daily too. Great interview! I’m curious if you or Dr. McGuff have heard of the following book and what are your thoughts are on it? Hi Shameer, Thank you for your kind words. I’m familiar with Ben but haven’t read his book. It sounds good though! 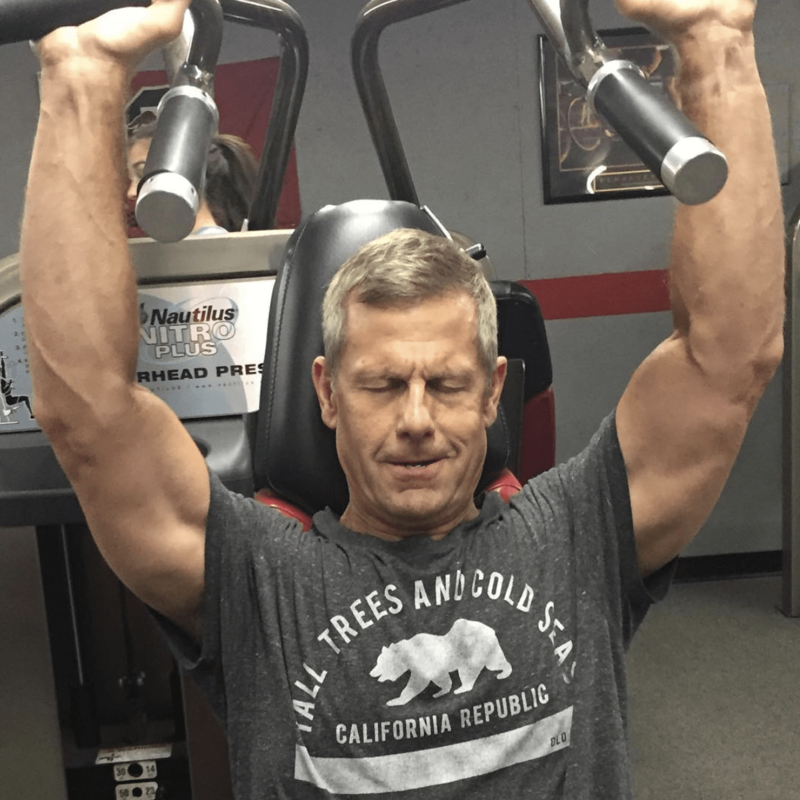 Lawrence, could you please explain in more detail how you perform neck exercises in a home workout. I am familiar with the pushing against the palms with arms resting on table (flexion) and using a belt (extension), both feel quite awkward to me and are not intense enough. You mention using a yoga mat….? Cheers.